As users scan the internet for places to buy that item they need, practicing search engine optimization, or SEO, can direct those customers to you and gain your store more web traffic. If you’re willing to do some keyword and competitor research and put in a bit of work, Shopify can help improve your rank in search results and bring more customers to your store. When you first start filling your pages, you will notice multiple fields for entering SEO-specific information. After doing your research, you can add your optimized page titles, product names, meta descriptions, and URLs – all of which can help point potential customers to your store and products. 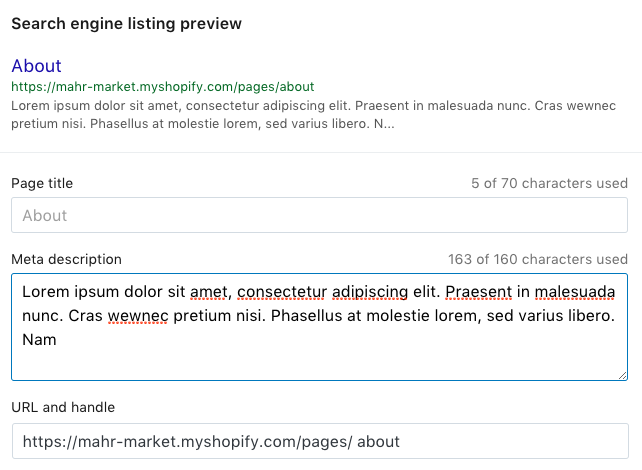 Whether you’re adding blog posts or new pages with information about your business and products, Shopify’s rich text editor streamlines the process of adding proper search engine title tags header tags, anchor text, and image alt text to all of your content. If you don't know what all of that means yet, don't worry. Or feel free to skip to the article << Adding SEO keywords to your store >>. As a Shopify user, you have access to forums devoted to ecommerce marketing to ask any questions you might have. And you have the freely available Shopify Manual, including a whole section devoted to SEO. Shopify is also constantly adding new content like Ecommerce SEO 101, a video series that outlines what SEO is, what search phrases you should rank for, how Google might rank your store. SEO keywords are the words people use to search for information online. Before creating your store, it is good to know what keywords potential customer is using to look for products like yours. Once you know these, you can utilize those words to help your customer find you through search engines. But the more popular the word, the more competitive it will be to rank well. Researching what words your competitors rank for and examining at how they use keywords on their website can help you find what you can do better and how you can be different. If your site is brand new you have a lower chance of ranking for high competition keywords that receive lots of clicks. Building any website’s SEO takes work, a bit of time, and patience. There are a number of tools you can use to find keywords you should target, including free ones by Google that provide everything you need to get started. Google’s Keyword Planner will not only help find the keywords, but will also give you forecasts for predicted clicks, and tell you how competitive each keyword is. Because Keyword Planner is part of Google Adwords, you will also be given the ability to bid on search terms for more web traffic. You can use Google Trends to quickly compare similar keywords and their relative popularity over time, so you know whether to market your new product as a “small wallet” or a “card wallet” on your store. It’s great to use in conjunction with Keyword Planner. There are dozens of paid SEO tools you can use to strategize a shortlist of keywords suitable for your store, analyze your competition, and find your own SEO weaknesses. And many offer more details instructions and data that can help you optimize your website. If you need this extra help, it might be worth starting your free trial of Moz and going through its extensive Beginner’s Guide to SEO. Tools like Wordtracker and KISSmetrics also offer free trials and can provide insightful information, depending on the kind of store you’re running and how much data you need. No matter how much you spend, don’t forget that you’re not marketing your site to Google – you’re marketing it to real people who wanted to be communicated to by humans, not search engine keywords. Don’t spam your visitors with keyword after keyword if it’s all meaningless or irrelevant to your products. Once you’ve finished your keyword research, you can start inputting what you’ve discovered throughout your Shopify store. To start, you will want to enter global information into the fields on the Online Store > Preferences > Title and meta description section of your Shopify dashboard. The information you put in your Homepage title field will be what is included within your <title> tags in the code for your homage. That means that when your store's homepage is in returned in a search on Google, that is the text a user will see. In the same way, the Homepage meta description is what will be included in your HTML and will tell search engines what your site is about, so it can display it to users underneath your title. 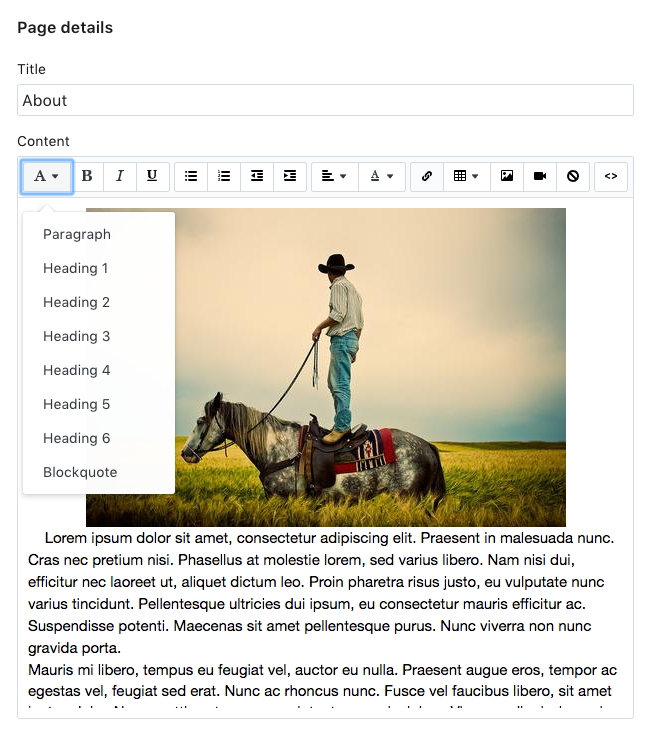 Your Homepage title is the first thing users will see if your homepage appears in their search results. It also tells search engines what your site is about and what content it might find there. Search engines use your title tag and page content and ranks it against other sites about the same topic accordingly. As you think about your title tag, an important aspect to consider also is the placement of your keywords in the title. Google considers keywords closer to the beginning of a title tag most important. Your company name or brand can appear at the end of the title. Title tags should also be easy-to-read and under 70 characters long, as most search engines will not display titles longer than that. Users might not be interested to read a long list of keywords or might think it’s spam. The other field you will see in your store details is for your Homepage meta description. Meta descriptions don’t affect your page rank, but a well-written meta description can help attract customers. The meta description is the description in search results underneath the title and URL of a page. This is what users often look at to decide whether to visit a page or not. Shopify puts a cap of 160 characters on the homepage meta description, but it is best to keep it down under even 140 characters. This is where you can flex some of your creative muscles to write a great description of your shop that uses the language that tells customers that you know what you’re talking about. Consider any place that you can add text to your website a chance for SEO. Including product descriptions, page content, and Search engine specific fields. Optimizing all your pages with headers (by using the Formatting option in your rich text editor's toolbar) that use your targeted keywords also helps them rank better in search engines. Each page will be different, and might but this is also, much like the blog, another opportunity to use well-placed keywords to attract customers and remind search engines of your store’s existence. Shopify’s SEO fields enable to your optimize all of your pages, product pages, and blogs quickly. 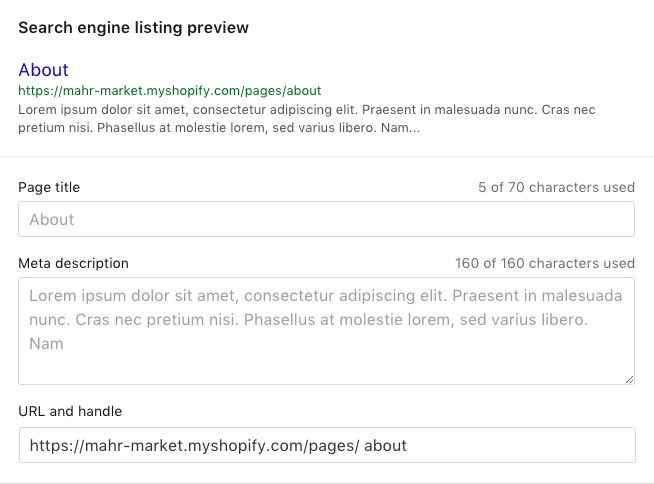 From the Pages section of your Shopify dashboard, you can look through each of your pages and ensure its Search engine listing preview section is filled out with its own unique Meta description and an optimized URL & handle. The area above will update automatically with what users will see when your pages show up in their search results. Meta descriptions never effect SEO directly. They only serve as the description users will see if your page appears in their search results. It doesn’t need to target keywords, but you need to convince your customer that your shop is better than any competitors in the search results. Using keywords within your URL is very advantageous for SEO. Google interprets words within a URL what the whole page is about. Putting exact keywords in your URL is a good way to start helping your page rank for those keywords. Perhaps more important than most other pages are your Shopify product pages. These are the pages 100 percent devoted to your inventory. Here you’ll find a product details area, where you can tell customers about the product itself, the Search engines section, as well as areas for Tags and Images. Tags will help organize your inventory for those searching for specific features or attributes, and images will show customers how a product looks, and maybe how people use it. There are many SEO factors for images. Almost as important as the image itself are the image’s alt tags, which tell search engines and users unable to view images what an image is about. Once you have a list of SEO keywords that will help customers find your store, it is time to ensure that your content uses those keywords and is interesting enough that people will link back to your pages, products, and blog posts. Keep a guide to on-page SEO close by – or your top-performing freelancers – and get creating. If many people are searching for products like yours, you can anticipate what they’re searching for or what interests them about it. So write content that engages with them personally. Make it clear, concise, and honest. Make sure each word carries its weight. Correctly identifying your customer and their needs is the first hurdle. Now it’s time to communicate with them. Shopify’s blog has some tips on writing product descriptions that you might find helpful. What makes your company’s story unique? Why should customers care? What makes your products preferrable to your competitor’s products? How do customers use your products? Does your industry trust what you have to say about anything? Read some recent top stories on Medium and figure out how you can best engage your customer. What content will inspire them and make themwant to send it to friends? Having an active blog that comes at your products from different angles can help bring in new visitors, help returning visitors become first-time customers, and help returning customers remain loyal. Writing engaging content marketing ( like Shopify does – all the time)can be an act of customer service in itself. But it isn’t enough to just write often – you can’t fake it and hope more sales. You need to care about the content, and you need to show that. And, of course, double check for typos and sentences that don’t quite make sense. Creating links on your store helps customers find useful information about your brand and how it connects to the world around it. You will want to create both <<internal links>> to your store's other pages and <<external links>> to other high quality websites that help inform your customer. Relevant links can help boost your Shopify’s SEO and keep your customers on your page longer. But what is a good link? You could link to this Moz article about anchor text with anchor text, or as a naked link, http://moz.com/learn/seo/anchor-text. Naked links are links where the anchor text is just the full URL. These can often be long and ugly – sometimes upwards of 50 characters long. Using anchor text is often a better way to describe what the user will find on the other side of the link, too. For example, you know that when you click on the text “this Moz article about anchor text” you can expect to read an article about anchor text, although you might not know what Moz is. Many people use anchor text like “ click here” or “more info” for their links. This is unhelpful for two reasons. One, it doesn’t tell users to understand where they are going. And two, it doesn’t tell search engines what the page on the other end of the link is about, and whether it's relevant to the content on your own page. If everybody made high-quality anchor text, the web would be much more accessible and easier to search through – for users and for search engines. 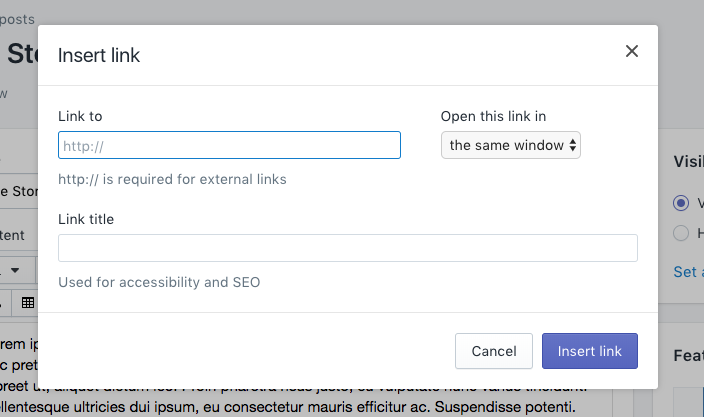 If you want customers to stay on your page after they’ve decided to follow a link, make sure you’ve set the link to open in a new window when adding it. When linking to your own pages, you’re telling search engines what your pages are about, and you’re reinforcing the relationship between your pages and their hierarchy. If some pages aren’t linked to from your own store, neither your customers or search engines will be able to find them. In most cases, that’s not what you want. When you start to see links to your pages from other websites, you can see what their anchor text says about your store.